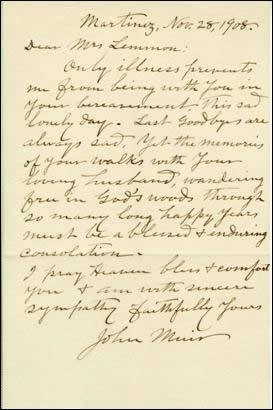 A letter to Mr. and Mrs. Lemmon from John Muir one of the many examples of information beyond the specimens held at the UC and Jepson herbaria that provide a deep insight into the historical context behind the collections. 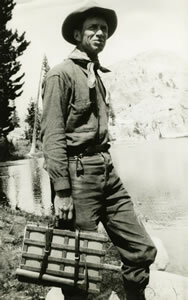 Willis Linn Jepson in the field with a plant press. The University and Jepson Herbaria Archives collects, organizes, preserves and makes accessible information related to the University and Jepson Herbaria and the history of Botany at the University of California, Berkeley. The archives uniquely complement the specimens held in the University and Jepson Herbaria and contain a wealth of primary source materials. Our holdings include institutional records, such as visitor logs and correspondence, as well as personal papers of botanists associated with the Herbaria including Willis Jepson, William Setchell, Townsend and Katharine Brandegee, and many others. The collection is rich in correspondence, field notes, and photographs. Materials cover California and beyond as botanists associated with the Herbaria traveled and corresponded internationally. The bulk of our collections are unprocessed, but with the help of a Cataloging Hidden Special Collections and Archives Grant from the Council on Library and Information Resources (CLIR) we are working to make them available to researchers. As collections are cataloged, they will be added to our online Archon database. Read more about this project, Cataloging Hidden Archives of Western Botany and Beyond. To learn more about the holding of the University and Jepson Herbaria Archives, see this article written by Dr. Richard G. Beidleman, Research Associate and long time volunteer archivist or go to an overview of our collections. For more information or to make an appointment to visit the University and Jepson Herbaria Archives, please contact the Archivist.